First off, I apologize for the title, sometimes I have no self control. Just dropping a few quick notes and some pictures following up on the finish of the Loom project. If you want to see the other portion of the construction you can check out that post HERE. First off this evening I did a few simple carvings along the uprights of the loom. I know it's supposed to be a work piece but dammit I'm working with Mahogany here and I've heard several times what a treat it is to carve with. So being a feet first kind of guy, I took to it this evening. Now I am still very much a novice at chip carving with chisels, most of my carving before was done with a dremel tool and a burr style bit. I have done a lot of watching of videos on the internet and learning the techniques of others that way. I have to say that probably the most influential person for me to watch has been Peter Follansbee, you can watch his carving technique demonstrated when he visited St. Roy and the Woodwright's Shop HERE. (there are several other videos out on the internet as well, but you'll have to do your own googling)I love how effortless he makes it look. There is no over planning, and no stress about pristine perfection, just the practiced ease of a master at work. I can definitely respect that, and try to imitate it until it becomes second nature to me as well. I had a small section of Mahogany leftover, about 8" long, and I used that to play with a few simple ideas. I wanted something that was reminiscent of a celtic knot string, but was no where near that involved. It also had to be easily accomplished using the two quality carving tools I own, A shallow gouge and a V tool. After a couple hits and misses I came up with something that looks a bit like a twisting rope. Here is the process I used to pull it off. I started with a dividers, stepping off the distance that each twist of the carving was to take up. 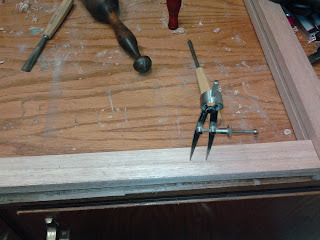 Then I took the gouge and, holding it straight up and down, struck it with a mallet making a curved cut into the wood. I repeated this for two opposing rows. Then I took the gouge and laid it shallow to the outside of the line, pushing a half moon cut into the struck cut, The picture explains this better than words and I'm showing here the cut in three steps, staring maybe a quarter inch from the previous line and pushing the second cut at a shallow angle into the first, leaving a half moon cut. I then used the V tool to connect the half moons together with a sweep between them. A couple more touch ups to finish the round. 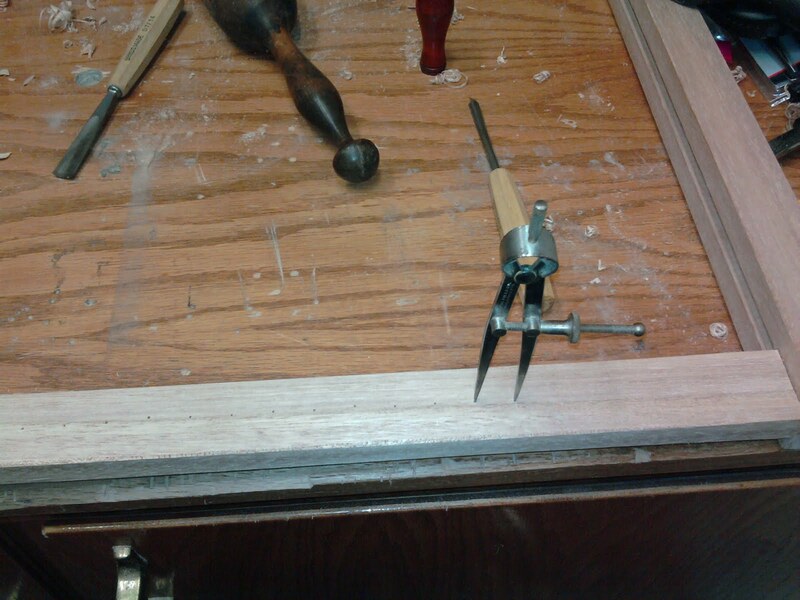 Then I took my scratch awl and pounded a single point into the center of the twist. This just seemed to finish off the thought, add a little punctuation to the carving. All in all the carving went past very quickly and the loom was ready for a finish. I hand rubbed on a coat of Natural Danish Oil, and man oh man did that make the mahogany pop! Anyway the Loom for Lady Ann is done, On to other mayhem. Escape to the Bat Cave Boy Wonder!! And Lo, There Stood a Loom.